Our (very large!) extended family has a bunch of weddings coming up yet this year, and our calendar for fall of 2019 is already filling up. It’s going to be a fun couple of years! I look forward to seeing the beautiful brides and their adoring grooms. I’m eager to see the dresses and tuxes. Reunions with family and friends. Fun at the reception. Delicious food… What’s not to love about a wedding? So when I attend a wedding, I have many questions running through my mind: will their be pre-wedding music? What will the processional be? Will they have music during the wedding? During the lighting of the unity candle? Will their be any congressional music? And what will play during the recessional? Will the music be provided by organists? Pianists? Vocalists? A recording? Other instruments? All of the above? I admit, I’m disappointed when music plays a small role. What about you? 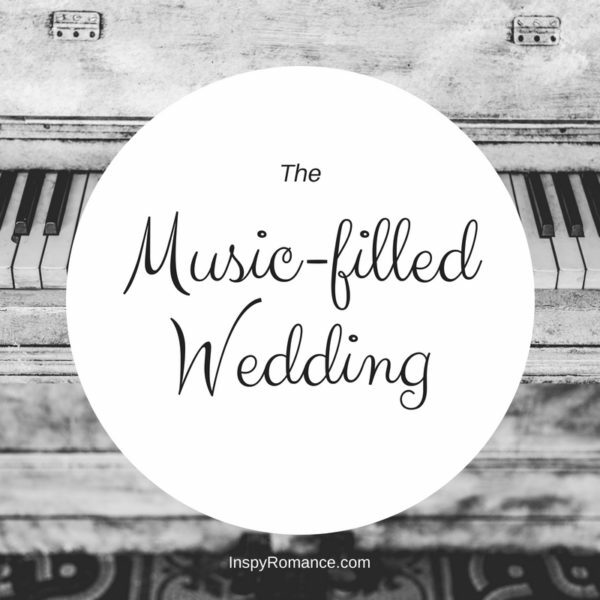 Do you enjoy a music-filled wedding? Do you have a favorite song (or songs) you love to hear? Hi Brenda, it sounds like you have some lovely, family filled times ahead:) I love music and I love weddings- our wedding was the weekend after our university graduation . I remember getting to the Friday rehearsal before our wedding on Sunday and being asked what music we had chosen. We had talked about it, but had gotten so busy with final exams, graduation preparation and graduation and then packing to move south, that it completely slipped our minds!! So, the Friday before, here we are sitting down, frantically trying to find all the songs we had been thinking of and getting everything ready- I smile and have a laugh now, but at the time…on man!! Oh, wow! I can’t imagine having to worry about graduation AND a wedding! That you pulled off graduating and getting married is no small feat. Hi Brenda! I enjoy music at weddings. My husband sang at a few of his friends’ weddings. His best friend is a trained musician, who sang the prelude and The Lord’s Prayer at our wedding. His wife also an accomplished musician played the organ. My 14 year old brother played the violin at the reception. My middle son’s father in law played the harp (he made) at their wedding. He is also an accomplished musician. Pachelbel’s Canon and The Lord’s Prayer are two of my favorite wedding pieces. Best wishes and Happy Writing. Isn’t it wonderful, Lucy?! To me, beautiful music is a perfect way to celebrate a marriage! Recently my niece sang to her groom as she came down the aisle. She did a beautiful job. I wish I could tell you the song, but it was appropriate and emotive. A friend played piano for ours, way back when. My bridesmaids came in to The Love of God. Another friend played a trombone solo for the recessional. I can’t remember now what he played at the wedding, but at the rehearsal, he played Onward Christian Soldiers and got a good laugh out of everyone! Wow! Singing as she came down the aisle?! That’s impressive! I’m sure there wasn’t a dry eye! Isn’t it wonderful to have talented friends & family to share in your special day?! I enjoy a music filled wedding. My daughters both had a lot of music, some original, for their weddings. People commented on it afterwards. We had a lot of friends willing to share their talents. How cool to have original music! Love that! It really is a blessing having musical friends to share this special day! I’ve seen the good, the bad, and the ugly at weddings, being a pianist/organist/soloist! LOL! When it’s good, it’s wonderful, and when it’s bad, I cringe for everyone! Two weddings come to mind, however, that I had no part other than that of guest. One was a Church of Christ wedding (no instrumental music) that featured a vocal ensemble. It was amazing. It helped that this was in a college town with a wonderful music department, but they did a medley of “wedding” songs, including “Goin’ to the Chapel,” during the slide show that was just wonderful. Another was our minister of music’s wedding. They had a harpist, and it was so soothing, not to mention beautiful. Funny, isn’t it, how it’s the different that stands out? Oh, I can imagine the music you’ve heard, and being a musician, you’re likely fairly picky (I know I am!). I love music that’s *different* as well, something that stands out as well thought out and fitting for the couple. Your wedding sounds so lovely, Brenda. I’m ashamed to admit music wasn’t a big thing at our wedding. We had one song sang during the ceremony and a piano for walking down the aisle and leaving. Around here, that’s usually the way it is. Music takes a back seat. Maybe we need to step up our game in Arkansas. I really like the movie Father of the Bride and really came to like Pachelbel’s Canon in D as a result. It’s what plays as Annie walks down the aisle.